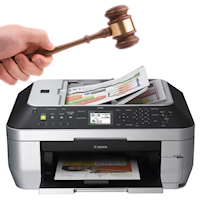 Pound the Canon MX860 repeatedly with a gavel. You’d think in this day & age of all-in-one printers, you could put a legal-size document in the document feeder (ADF) & scan away. Not so with the Canon MX860. Load up the MX860’s desktop scanning software, which Canon cryptically called “MP Navigator EX” — mine opens up to a wizard-style screen. Select “Stack Of Documents (ADF)”, the click the “Specify…” button on the left-hand side & there you can temporarily change the PDF document size for the next ADF scan. If you scan legal documents all the time & want to change the settings permanently: Click the “Preferences” button (top/right corner) & switch to the “Scanner Button Settings” tab. Then you can change the document settings for each one-click action. So for instance you could set the “Save to PC” action to scan a legal-size PDF & “Save to PDF” to scan in letter size. Sounds needlessly complicated? It is, absolutely. Hopefully Canon will add automatic document length detection for the ADF in a future firmware/software update, but I wouldn’t count on it.